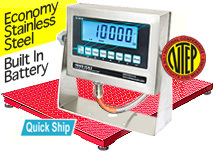 FloorScalesDirect.com offers a wide selection of 4x5 10,000 lb floor scales for sale. 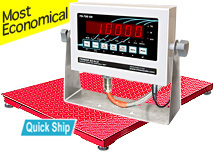 Our floor scales industrial packages include a self-leveling, shock absorbing weighing deck with diamond plated top. The floor scale packages also feature digital indicators, and all of the required cords and cables to hook up the system. 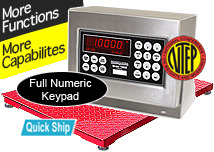 The floor scales industrial packages are rated for outdoor use and ship free to most locations across the United States. Our “Quick Ship” feature allows your order to ship by the next business day so your business operation doesn’t have to wait. 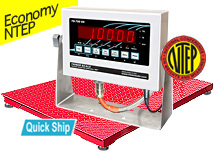 Our industrial floor scales are factory calibrated for the highest accuracy and ease of use. Customer satisfaction is important to us, so if you can’t find what you need or have questions about our products, call us toll free at (800) 238-0142 or e-mail us at info@floorscalesdirect.com. Don’t settle for second-rate service or floor scales. 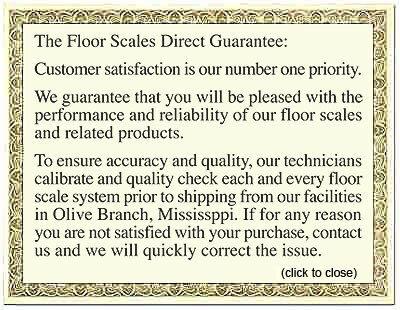 Discover the best floor scales for sale packages at FloorScalesDirect.com today.